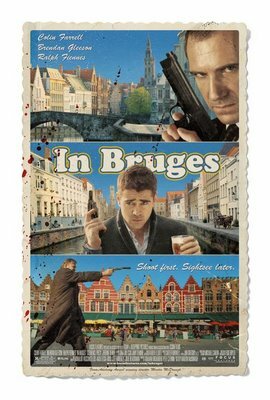 In the way that dark chocolate became a lot darker a few years ago In Bruges takes dark comedy gangster films and makes them a lot darker. Its an action thriller with little action. An 18 film that definitly deserves its certificate without being gratuitous. A film which isn’t what you’d expect but certainly doesn’t disapoint for it. A comedy where the audience isn’t certain when thet are supposed to laugh. Where Tarantino would cut the camera away just before Martin McDonagh holds a shot on the repercussion of violence till its uncomfortable. This isn’t a film that glorifies hit men but it does paint them as humans. Nasty vicious men but still human. Imagine pulp fiction stripped back to the two hit men, a couple of well drawn supporting characters and Marsellus. This is, from the start, a film of 107 minutes which mostly consists of a few characters talking. Often they are spouting rubbish but its well written, well delivered interesting rubbish.